Leeds-based speciality chemicals manufacturer The Stephenson Group is stepping up its support for the STEM (science, technology, engineering and mathematics) programme. The global manufacturing business, which specialises in soap production for clients such as The Body Shop and employs 100 people from its production plant in Horsforth, joined the STEM programme in May this year with a commitment of six volunteers from its workforce including CEO Jamie Bentley. The firm has pledged to double the number of volunteers over the next 12 months. The announcement coincides with the 2016 A level results which saw chemistry retain its position as the sixth most popular A level, behind maths, English, biology, psychology and history. This year’s A level results saw record numbers of UK university places offered as overall results showed a marginal fall in top grades for the fifth successive year. The proportion of A* and A grades was 25.8 per cent, down by 0.1 per cent on last year but the pass rate of 98.1 per cent remained the same. Encouragingly the gap between the very top-performing girls and boys at A-level has narrowed for the first time in five years. The number of girls taking STEM subjects at A-level has also increased again. With over 33,000 volunteers UK-wide, the STEM Ambassador Programme is a government-led initiative that encourages young people to think more positively about science, technology, engineering and mathematics – inspiring their study and career choices in these areas. There are almost 1000 STEM Ambassadors in the West Yorkshire region alone, and together, they take part in over 500 STEM-related activities across the region every year – predominantly working with secondary schools. So far, six employees from Stephenson Group in Horsforth have volunteered to be STEM Ambassadors including CEO Jamie Bentley, Lucy Simmonds – Technical Business Development Manager, Rachael Simpson – Group Marketing Manager, Charlotte Gronan – Intern Technical Chemist, Karl Godley – Shift Manager and Dave Bryant – Maintenance Fitter. Jamie Bentley, CEO of Stephenson Group Limited, said: “It’s great to see chemistry retaining its popularity with A level students and the science subjects proving a popular choice for university education and as a potential career path. 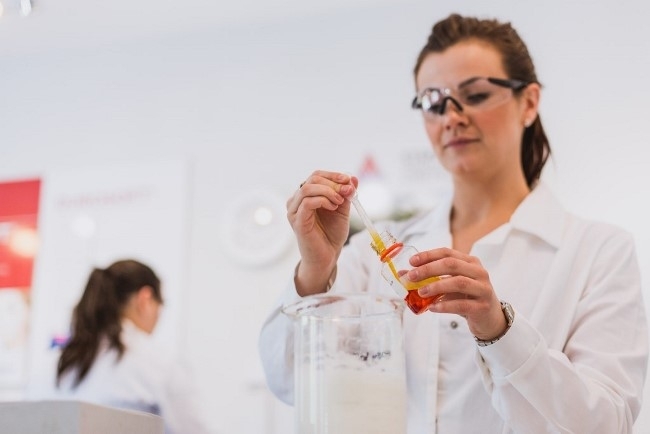 “At Stephenson Group we are passionate about creative chemistry and will do everything we can to encourage study of the subject and to help it grow in popularity. With a fifth of our workforce being engineers and qualified chemists, the STEM Ambassador programme is a great way for us to do this and also give something back to our community by sharing our experience and expertise. “As proactive volunteers we have been supporting schools in our local area through interactive talks, workshops and site visits to engage students about STEM.